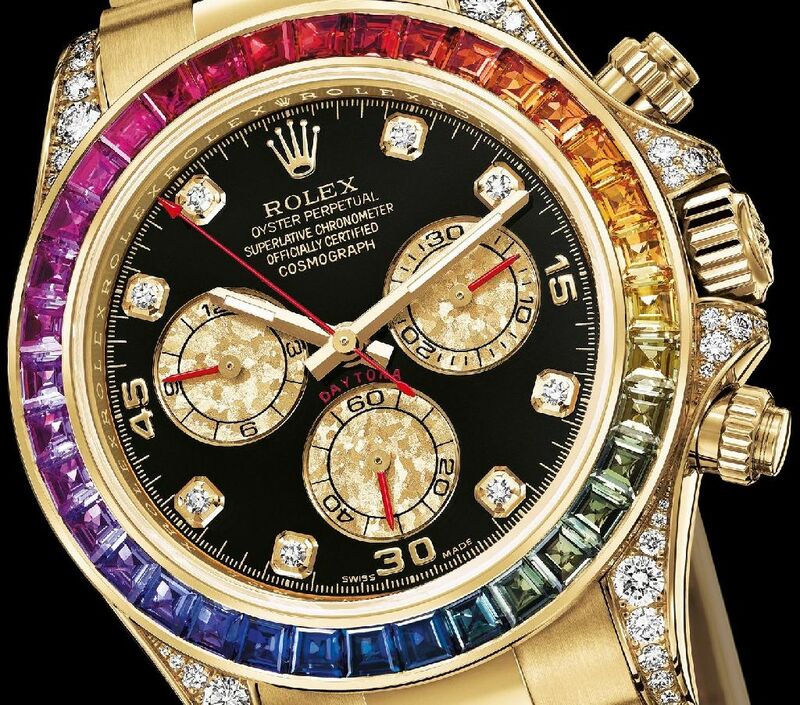 The latest model from the legendary Oyster Perpetual COSMOGRAPH DAYTONA line features exclusive bezel entirely set with an array of sapphires in rainbow colours and the exclusive GOLD CRYSTALS counters on the dial. The new timepiece comes in 18 ct yellow gold case and bracelet and is equipped with calibre 4130, a self-winding mechanical chronograph movement. Along with its 18 ct yellow gold case and bracelet, the new COSMOGRAPH DAYTONA sparks with a bezel entirely set with an array of sapphires in rainbow colours. All the nuances of the celestial arc are visible, a delicate palette of reds, oranges, yellows, greens, blues, mauves and pinks. The subtle grace of these fascinating stones meticulously selected, assembled and set by Rolex is magical, endowing the watch with a stunning radiance. Also gem-set, the case lugs, crown guard as well as the hour markers on the dial participate in the exquisite allure of this variation on the DAYTONA theme. Contrasting with the black lacquer of the dial, the reflections of the GOLD CRYSTALS counters blend with the radiance of the precious stones. 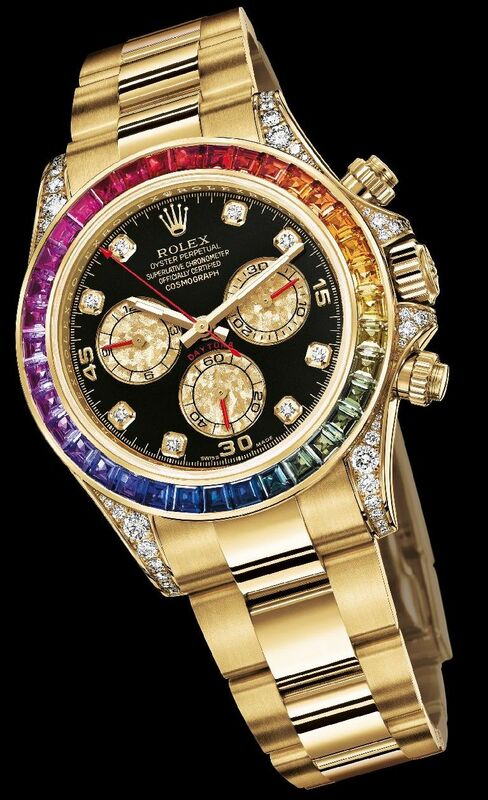 Crafted from an 18 ct gold alloy perfected by Rolex in its own foundry, these exclusive counters highlight the crystal structure of the gold in a seductive play of reflections and colours. Each counter is a natural work of art, different from every other. The COSMOGRAPH DAYTONA’s 40 mm OYSTER case, guaranteed waterproof to a depth of 100 metres (330 feet), is a paragon of proportion and elegance. The characteristically shaped middle case is crafted from a solid block of 18 ct gold. The fluted case back is hermetically screwed down with a special tool exclusive to Rolex watchmakers. The winding crown, fitted with the patented TRIPLOCK triple waterproofness system, as well as the chronograph pushers screw down securely against the case. It is protected by a crown guard that is an integral part of the middle case. The crystal is made of virtually scratchproof synthetic sapphire. The waterproof OYSTER case ensures optimal protection for the COSMOGRAPH DAYTONA’s high-precision movement Calibre 4130. The COSMOGRAPH DAYTONA is equipped with calibre 4130, a self-winding mechanical chronograph movement entirely developed and manufactured by Rolex. Like all PERPETUAL movements, the 4130 is a certified Swiss chronometer, a designation reserved for high-precision watches that have successfully passed the Swiss Official Chronometer Testing Institute (COSC) tests. Its architecture, like that of all OYSTER watch movements, makes it singularly precise and reliable. The oscillator, the true heart of the watch, has a blue PARACHROM hairspring, patented and manufactured by Rolex in an exclusive alloy. Insensitive to magnetic fields, the PARACHROM hairspring offers great stability when exposed to temperature variations and remains up to 10 times more precise than a traditional hairspring in case of shocks. The new COSMOGRAPH DAYTONA is fitted with an OYSTER bracelet in 18 ct yellow gold with the latest generation OYSTERLOCK safety clasp to prevent accidental opening. Developed and patented by Rolex, this elegant solid-link bracelet also features the ingenious EASYLINK rapid extension system that allows the wearer to easily increase the bracelet length by approximately 5 mm, for additional comfort in any circumstance.